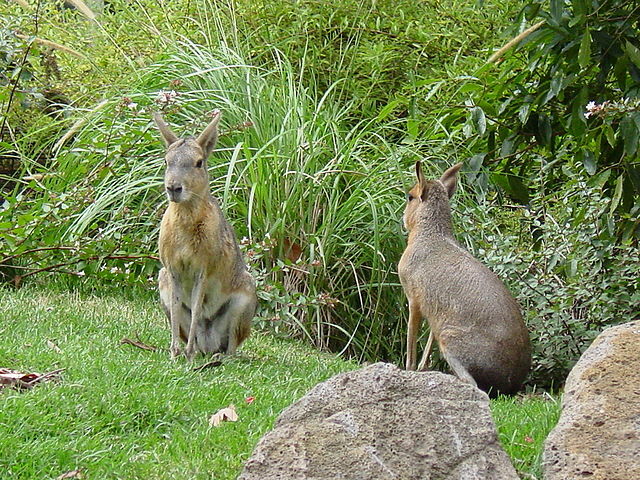 AKA Patagonian cavies… related to Guinea Pigs. Big cute highly social rodents. Ohai bigg guiney pigglies. U shur am cute. Dey dunnawt look lyke TJP’s Mara…..
Just wut Ai wuz going to say. Dey lukk liek a kangaroo/bunneh kross! Is bunneh plus pinnygig plus deer plus…luks like it wud be fun to has in the gardin. If yu planted tasteey fingies jus for it to eet. In Cheezland, the time is 20:57.